(i) Last date for receiving applications is 23.11.2010 upto 4.00 p.m.
(ji) No TA/DA win be paid for coming for interview. (iii) Application with full particulars and contact no., two Passport size photo and attested copies of Educational /Technical qualification & experience should be attached with the application other wise application will not be considered. 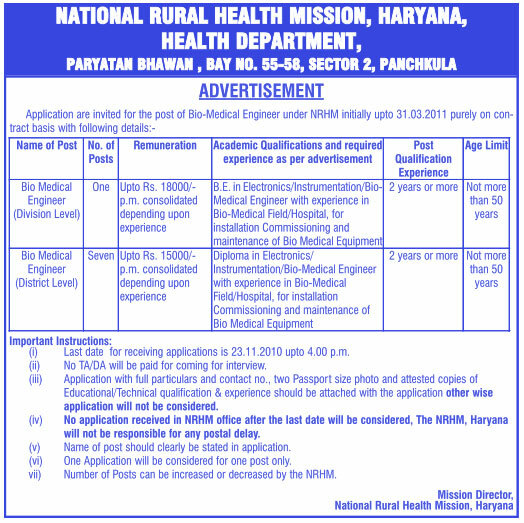 (iv) No application received In NRHM office after the last dale will be considered, The NRHM, Haryana will not be responsible for any postal delay. (v) Name of post should clearly be stated in application. (vi) One Application will be considered for one post only. vii). Number of Posts can be increased or decreased by the NRHM.